The most famous landmark of Semarang city Lawang sewu is a colonial building that was built as the headquarters of the Dutch East Indies railroad company. The name Lawang Sewu comes from Javanese, which means "thousand doors". The name comes from the design of a building that has many doors. The oldest Chinese temple in Semarang The temple of Sam Poo Kong serves as a place of worship for people of various ethnicities and religious groups. The Sam Poo Kong complex includes five temples namely Sam Poo Kong, Tho Tee Kong, Kyai Helmsman, Kyai Jangkar and Kyai Cundrik Bumi. There is also a worship site called Mbah Kyai Tumpeng located inside the complex. Railway Museum The Ambarawa Railway Museum was founded in 1970. The museum was built to preserve various choices of locomotives of various types and ages. Some old locomotives can still function and are still used as tourist trains. Gedong Songo Temple is one of the temple complexes with the most beautiful sites. There are nine Hindu temples that stand at an altitude of 1,200 meters above sea level with stunning natural scenery and cool air. The Central Java Grand Mosque is a magnificent mosque with Javanese, Roman architecture built on 10 hectares of land. In the mosque section, there are 25 pillars that symbolize the 25 prophets known in Islam. In the outer area of ​​this mosque there are 6 giant electric umbrellas and a 99-meter tall tower where we can see the landscape of Semarang from the top of the tower. Semarang Old City presents the beauty of European architecture in the past. Most of the building is an ancient building from Dutch colonial heritage. Some of the heritage buildings that can be found here are Gereja Belenduk, Jembatan Berok, Marabunta building, Old cigarette factory, etc. Colorful village For those who like to photograph the Kampung Pelangi area is a very suitable place to take pictures. Kampung Pelangi is a residential area located on Jl. Dr. Sutomo Semarang, all the buildings were painted in colors like the color of a rainbow. Culinary hunting place in the Chinatown area On weekends starting at 17.00 WIB until 22.00 WIB hundreds of culinary traders lined up along Jalan Semawis or also known as Semarang Chinatown. Here you can enjoy a variety of traditional Semarang culinary delights, rare culinary delights to the present culinary. The Simpang Lima Semarang area is a bustling center in the heart of Semarang and the Pancasila Square is still the main attraction. Crowd in this area began to appear since 17.00 WIB. 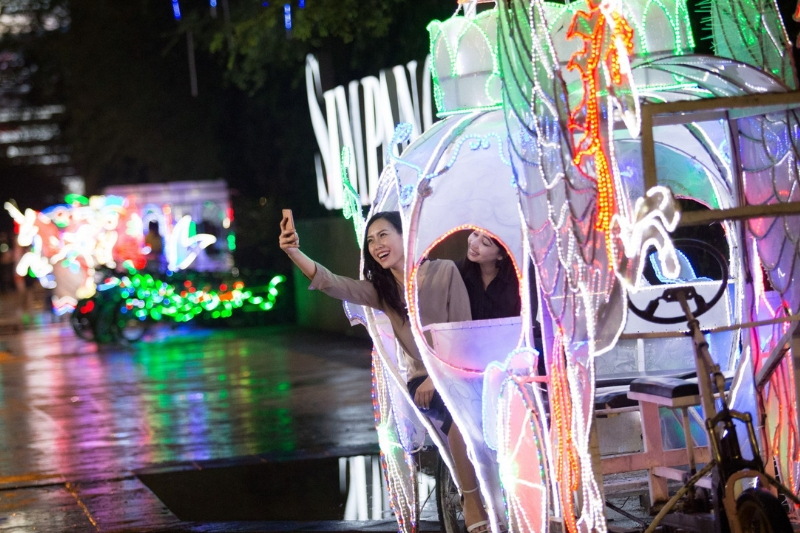 Dozens of pedicabs decorated with lights with unique shapes can be rented to get around the field or for self-portraits. Around it there is also a special area that presents a variety of typical culinary Semarang. © Copyright GranDhika Pemuda Semarang 2019. All Right Reserved.